Truly wireless earbuds. Apple’s AirPods are the best known example, but there are plenty of clever boffins in labs turning out these super portable headphones. The properly wireless design makes them feel magical, but it also brings some challenges. Today, we’ll be testing the Soundbeats Q29 to see how these £40 wireless earbuds measure up. The Q29 have a simple design; they are in-ear headphones that terminate in a blob of plastic instead of the traditional wires. Each unit has a small LED indicator and a multi-function button that can be used for power, pairing, pausing or skipping songs. 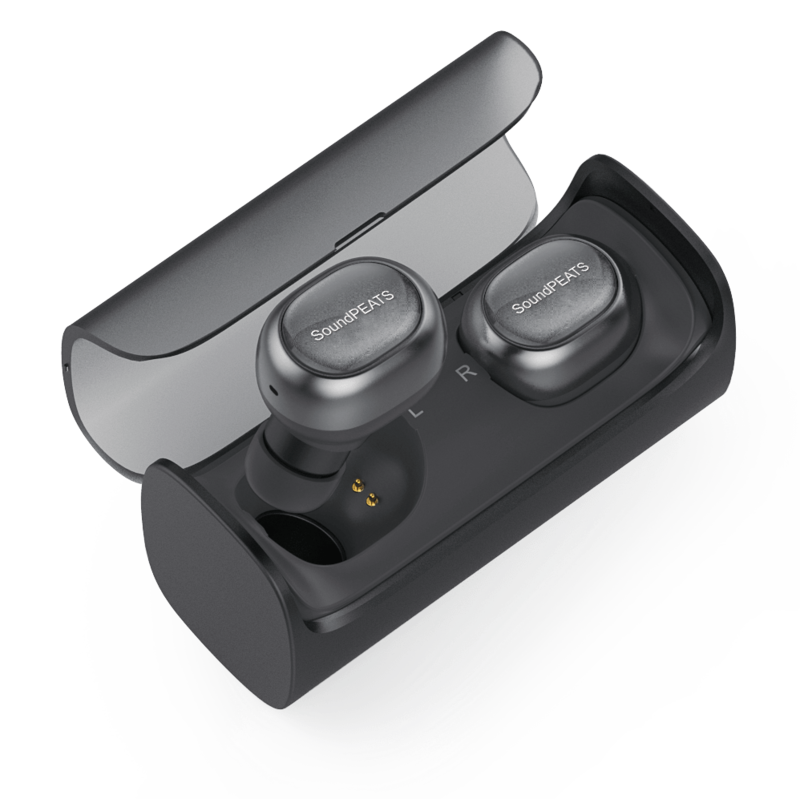 The black colour and rounded shape of the Q29 earbuds make them fairly innocuous, at least compared to the rather more eye-catching AirPods. 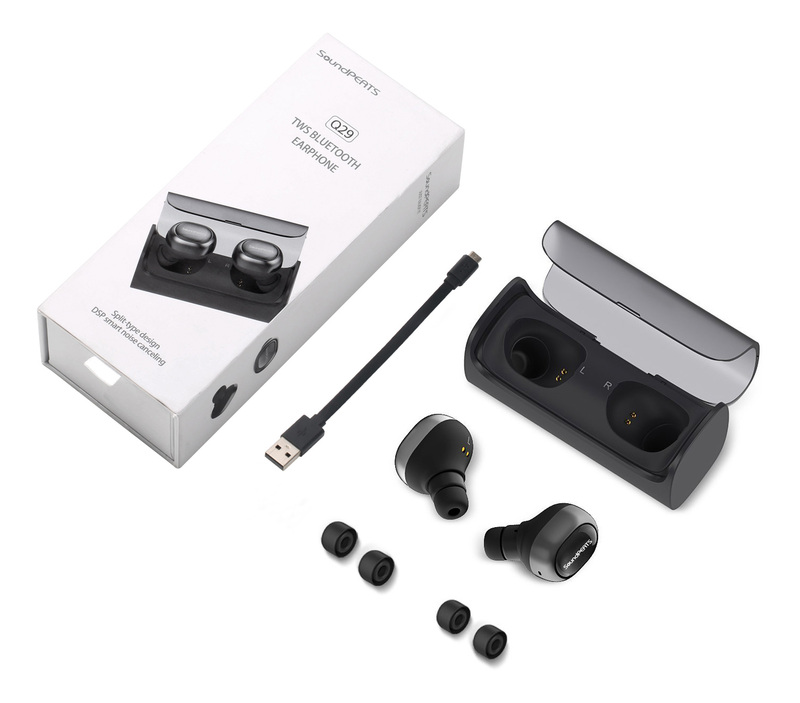 The Q29 earbuds come in a black plastic charging case, about the size of a tube of mints. The earbuds attach magnetically to pogo pins within. A Micro USB port on the back recharges the case’s 220mAh battery, which in turn charges the 45mAh battery inside each earbud. When the earbuds are charging, an LED is turned on. Our testing will look at four major areas: sound quality, connection stability, usability and battery life. We’ll be testing the Q29 with a Samsung Galaxy S7 Edge smartphone and uploaded tracks from Google Music. The Soundpeats Q29 have adequate but hardly stellar aural characteristics, with good detail in the mids but little bass and somewhat poor reproduction of higher frequencies. This isn’t surprising given the small size of the headphones. The overall sound is no better or worse than I would expect of any cheap pair of in-ear headphones; there’s not much else to say here. In our testing, the Q29 disappointed when it came to maintaining a stable connection. Even with a smartphone sitting half a metre away, there were still occasional drops between the lead headphone and the smartphone. This kind of interruption is less annoying than the connection between the two earpieces being disrupted, but it’s still disappointing. This being said, the connection didn’t worsen substantially when our phone was placed in a pocket or bag, which is far better than the last wireless earbuds we tested. In terms of the fit, I generally found the Q29 quite comfortable to wear for hours at a time. The light weight of the headphones, and the lack of wires, makes them very convenient to use. Of course, this is balanced out by the need to return the headphones to their charging case every few hours, but it’s still a net win for the Q29. Setting up the Q29 is not immediately intuitive, but is easy enough to accomplish assuming you take a brief glance at the instructions. The right headphone needs to be turned on and set to pairing mode by holding the key down, then connected to your smartphone. To connect the left pair, you need to hold its button for three seconds; it should then find the right headphone and then you’re off to the races. As well as using the Q29 in stereo mode, you can also use the headphones in mono mode, paired to the same or different smartphones. We found this to be of limited utility, but I suppose it’s nice to have the option if you wanted to share music with a friend without each of you missing out on one channel. The multi-function button also allows songs to be played, paused or skipped. There are no volume controls, which is understandable — you don’t want to jam more functions on a multi-function button, even if it’s technically possible, just because it starts getting a bit much to keep in your mind. One important design characteristic of truly wireless headphones is that there is a certain amount of audio lag. The first earpiece has to receive the audio signal from your phone, then send it on to the other earpiece before starting to reproduce the audio for your ears. That means there’s some necessary delay to ensure that both headphones are playing in sequence, compared to a set of Bluetooth headphones that use a wire to connect the earpieces. This isn’t noticeable when playing music, but does mean that there’ll be a small amount of audio lag when playing games or watching videos; any time there is synchronised audio and video. The Q29 is intrinsically affected by this, so you might consider a more traditional design if you plan to watch a lot of videos or play games with these headphones. Another potential drawback of the fully wireless design is that it’s a lot easier to have these fall out of your ears than traditional wired or wireless headphones. I didn’t have many issues with this using the Q29 on the train and at home, but I could easily dislodge the headphones by shaking my head rapidly. I wouldn’t want to use these for running or biking, where it would be all too easy to lose one for good. One final area to mention is battery life. The Soundpeats Q29 page suggests that the headphones will last for 150 minutes, which is approximately what we got in our testing. The headphones can be recharged multiple times in the case before the case itself needs to be recharged, and in general this was enough for occasional use throughout the day although you couldn’t leave this in for a whole work day, for instance. Ultimately, the Q29 gets passing grades in sound quality, usability and connection stability. Although it doesn’t shine in any one area, it justifies its admittedly low price point and could be used as your primary pair of headphones. You can get the Q29 from Amazon.co.uk for 40% off with the code Q29SOUND, which makes these a much better buy.